The first part of our hike in Isalo National Park was in an area of grasses and low-growing shrubs that offered little protection from the morning sun. But eventually the shrubs started growing taller, and soon we found ourselves in a forest, albeit one with a thinner canopy than I’d become used to in the rainforests. We were only a few hundred meters in when we heard rustling in the fallen leaves, followed by snuffling sounds that reminded me of a certain family member who occasionally likes to press her nose against the glass and snort like a pig. 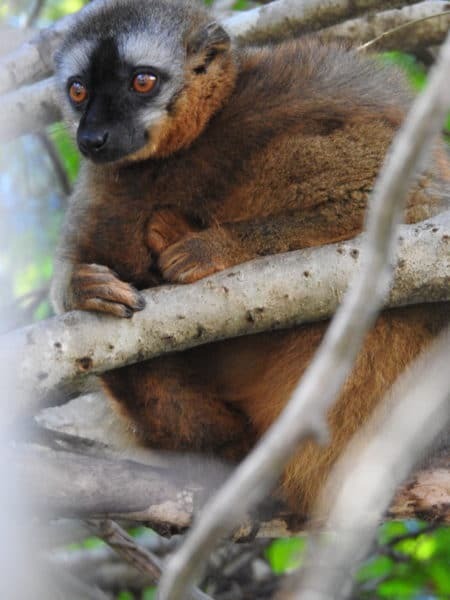 A quick scan of the surrounding brush identified the culprits: a troop of red-fronted brown lemurs (Eulemur rufifrons), so named for the reddish patch of fur on the foreheads of the males. Members of the Eulemur genus, to which this species belongs, are relatively adaptable when it comes to sharing space with human beings, and these particular lemurs are used to humans traipsing through their forest. So they were only moderately shy. We made no sudden movements, and they in turn leapt across our path with very little concern. One sniffed my trail shoes, which made me think perhaps they are not such atrocities after all. You see, these shoes have been the object of many jokes among our group. (Don’t feel sorry for me; I’m the one who started it.) I have very wide feet and spaced out on buying trail shoes for the Madagascar trip until the day before I had to leave. Oops. The only trail shoes in my width at the local shoe store were a hot pink pair limned in neon orange. They are visually offensive on every front, but they fit. Also, if I get lost in the woods, all I have to do is take off a shoe and wave it in the air. There would be no mistaking the shoe for a forest bird. Rangers would immediately find me. The lemur sniffed no one else’s shoes, so I felt pretty special. If it takes wearing hot pink shoes to get a lemur to walk up to me, I’ll wear them. 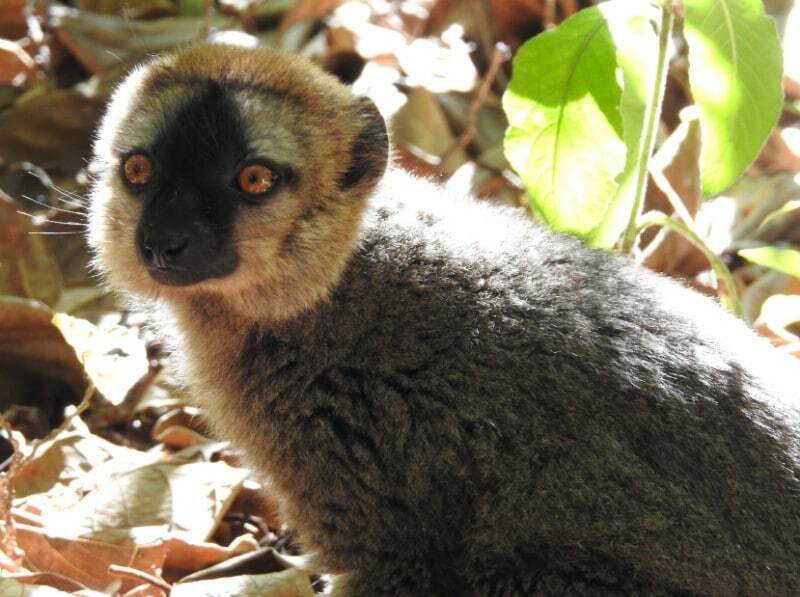 We took our time getting close-ups of the lemur troop. Lots of ooohs and aaahs, and not a small amount of cooing, were involved. Other lemurs seemed to have the same idea. They clustered in the tree boughs, inching silently toward our table. We watched them back as our guide explained that visitors to the park got into the bad habit feeding the lemurs at some point, and now they feel entitled to a taste every time a human opens a sack lunch. One of our group’s members took it upon herself to be the defender of sack lunches and the arbiter of keeping wild things wild. She picked up a hiking stick and, every time a lemur as much as looked at us, used it to shake the tree branches until they backed away. Several of them wrapped their tails around themselves in a gesture that reminded me of a child with a security blanket. I’m sure I am anthropomorphizing if I conclude that they felt shame. But their expressions did suggest they were reconsidering their life choices. That, or they were just biding their time until the crazy lady stopped waving her stick and they could go back to stealing food from people who thought it cute.